Every once in a while I will go back to my favourite Omakase restaurant in Mohd Sultan Road – Hachi. To my surprised, the chef has changed. A new man is in-charged – Chef Yama from Osaka. So we anticipated the change in cuisine and cooking style – which is slightly sweeter and flavoured than Kyushu-style cuisine the former Chef Watanabe-san. The dinner started with a couple of starters – a Potato Salad with Japanese Mayo, an Onsen Egg with Ikura on Kelp Sauce, a freshly shucked Pacific Oyster with Ponzu sauce. Kind of repeats of what were served previously. Can’t really pin-point what has changed, as these are pretty standard fare. Then a sashimi and a tofu (Sesame flavoured). The tofu was hand-made and has a very beany taste. The texture also highlighted that it was hand-made, i.e. rough. 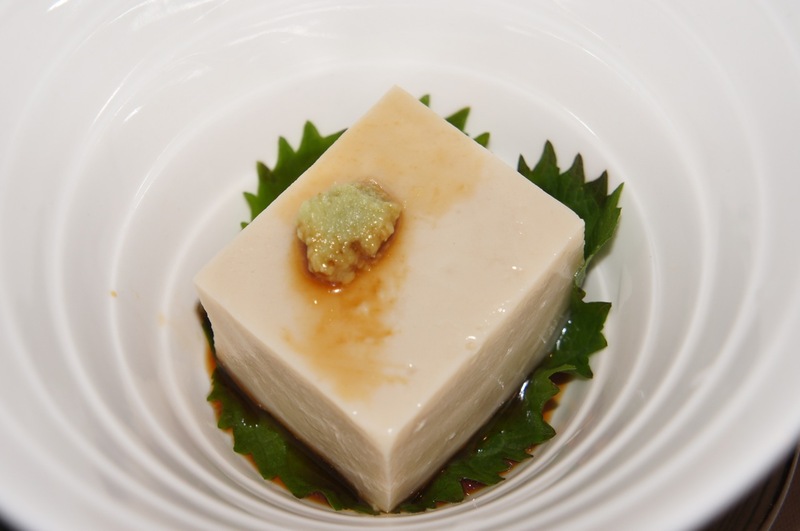 Nevertheless, it gave me a very familiar feeling of traditional tofu (not the machine made ones we get from supermarkets these days) that we used to buy from wet markets in the neighbourhood. Then a Duck Breast consomme rounded up the cold dishes. We then moved to the second part of the dining, featuring the cooked dishes that will feature Chef Yama’s culinary skills. First dish served is a Sweet Sauce Sanma Fish, which gave away where Chef Yama is from. The sweetness of the sauce and poached fish told me that his Osaka-style cooking was pretty evident. This was followed by Char-grilled Bamboo Clam in its own Juis and a small little cut of Kani that make its fame in Osaka. 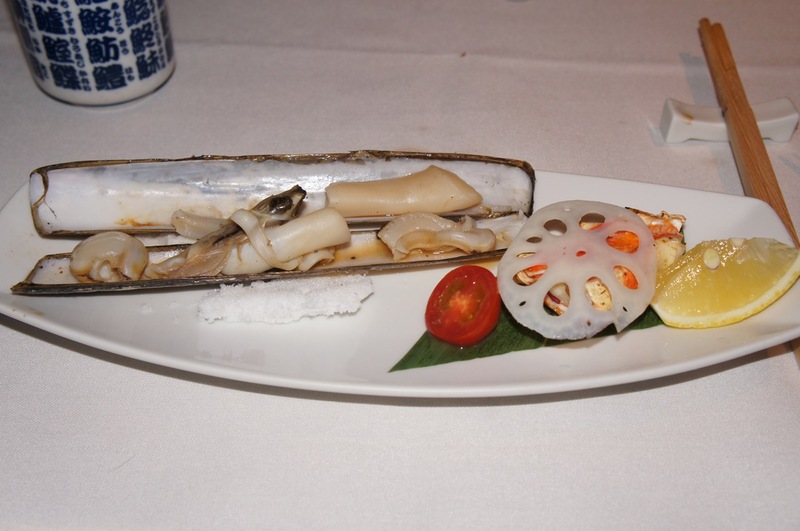 The bamboo clam was grilled to perfection, but the Kani (Hokkaido Snow Crab) was kind of too small. This was followed by Waygu, but he had used a cut of the meat that did not grill well and therefore was quite chewy. The fillers were a Chirashi rice and a Seaweed Soba soup noodle. and dessert was Sesame Ice Cream. As compared to other visits to Hachi, this one was a disappointment. For the same price we paid, the ingredients were a notch worse than before. And the preparation was not as elaborate as Chef Watanabe. Even the plating was sloppy. It was letter that we found out that Watanabe-san is preparing to start another Omakase restaurant, rumoured to be in Boat Quay, and returning to his Cuppage roots of small and cosy decor, seating for 8-10. I am looking forward to that. As for now, Hachi is still Ok, but not as good as before. Yama-san is definitely a much better host than our old friend, chattier and took the trouble to come over to explain the dishes, etc. 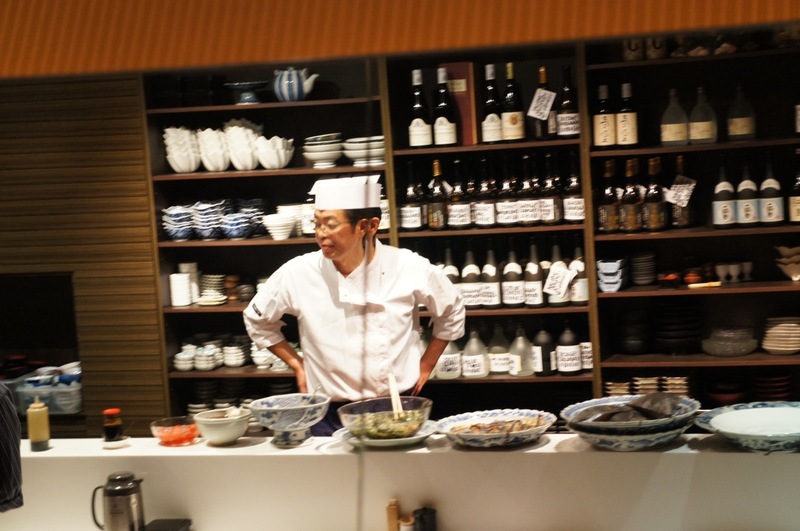 Very Osaka-style service – personal, jovial and candid. Nevertheless, in Omakase, we are looking for culinary excellence, and service cannot take over that no matter how good it is. Food: OK. Service: Outstanding, the entire crew is still around (I wonder how much longer). Ambiance: 20 seater main hall with 10 seater private room and counter space for 10, this is quite a fair sized restaurant. Price: Be prepared to spend at least $120++ pax excluding drinks.